Arrive at Damascus Airport to be met & assisted by your assigned guide. Transfer to Bosra for overnight. After breakfast, you will be escorted through the monuments of Bosra (the theater which is the best among its type in the world, the Lantern Gate, the Nabatean Gate, the Wind Gate, Al-Omari mosque, St. Serj & Bacchus Cathedral are to be visited) Head to Chahba, which was built as a replica of Rome. Qanawat is to be visited before arriving in Damascus for lunch. Departure for Palmyra via the famous Syrian semi-desert. Dinner and overnight. After breakfast visit the spectacular ruins of Palmyra, the archaeological museum, the tombs, the temple of God Bel, the arch of triumph & the colonnaded Street Lunch in a local restaurant. 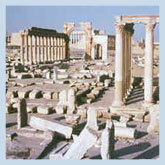 Hama and the archaeological site of Ebla are to be visited before proceeding to Aleppo for dinner and overnight. After breakfast, tour the highlights of Aleppo (the Citadel of Aleppo, the Archaeological Museum, the Grand Mosque and the Souq). After lunch, drive to the countryside of Aleppo to visit St. Simeon monastery. Back to Aleppo for dinner and overnight. After breakfast, head west across the coastal mountains to visit the medieval castle of Saladin. Lunch in a Mediterranean restaurant in the city of Lattakia. After lunch, visit Ugarit, the 2nd millennium site found by the Phoenicians. 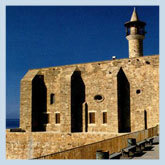 Head to Tartous to visit the Crusaders’ Cathedral then to Safita Village for overnight. After breakfast visit the white Crusade tower of Safita. Drive to Crac des Chevaliers to see the best Crusader Castle in the world. Lunch is in the King’s daughter’s tower. Afternoon visit to Ma’loula. Arrive Damascus for dinner and overnight. After breakfast, walk on “The street Called Straight” of Damascus. See the Folklore Museum and the fine collection in the National Museum of Damascus. Hear the story of the Conversion. After lunch drive to the top of the Qasioun mountain before returning to your hotel for dinner and overnight.